Dental implants enhance lives! They are the preferred solution among dentists and patients with missing teeth. Our dentist in Sherman Oaks offers dental implants that are a permanent solution and can help anyone missing their natural teeth. They do not slip out as some dentures do and allow patients to eat everything they did before missing teeth, often not only enhancing facial aesthetics but also improving patients overall quality of life. At Green Dental, we are thrilled to have a Periodontist and Oral Surgeon on staff. Our dental specialists perform dental implant placement surgery in our office so our patients do not have to go anywhere else but here! Surgical implant placement includes the implant (screw like piece) being placed in the jaw bone to act as the tooth root. Once the implant has integrated with the jaw bone (typically a few months later) the artificial tooth (crown) can be connected to the implant and the dental implant process is complete. Many of our implant patients tell us that they are thrilled with the results and only wish they had done it sooner! In addition to having dental specialists for dental implants onsite, we also have an in-house lab with our own master technician (with previous DaVinci experience) who builds implants, crowns, bridges, veneers, and can complete full -mouth reconstructions, right from our dental office. Our technician often meets with our clients face-to-face to make sure he creates a custom restoration that matches their natural appearance. Your new teeth will look as natural as if it they grew from your gums. 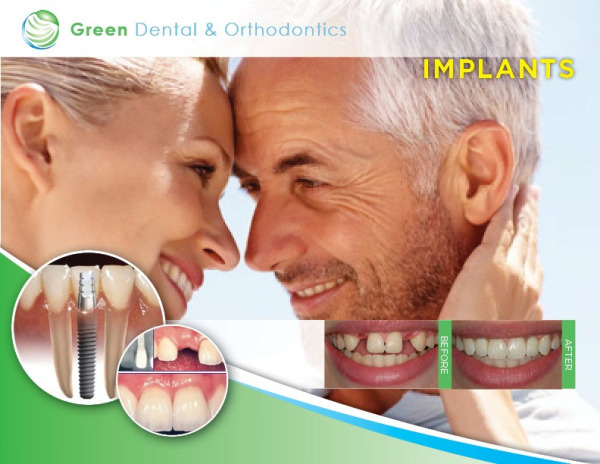 We at Green Dental & Orthodontics will reinvent your smile with dental implants in Sherman Oaks. Call us today and schedule a consultation to find out if implant dentistry will work for you.